The VIN number serves many purposes, VIN recall lookup is one of them. By the law, it is required that the manufacturers inform all the defective vehicle owners whenever a recall in issued. As a rule, the notification is send to the mail address associated with in the vehicle’s title. In addition, manufacturers spread press releases whenever a recall is issued. Auto manufacturers issue a recall when there is a serious flaw in a vehicle or its part. In such a situation, the manufacturer repairs the defect or even replaces the vehicle (if the defect cannot be repaired) at no cost. As a used car buyer, please be informed that VIN recall lookup alone does not guarantee safe purchase because the range of used vehicle problems is not limited just to being a lemon or a subject to recall. In fact, lemon vehicles, the ones with an irreparable defect that affects its value and your safety, make up a very small percentage of all used vehicles with a problem history. If you want to get real protection from you need to run VIN lookup online to get the vehicle history report from a reputable company like Carfax or Autocheck. These report will include all the essential information about the vehicle history (branded titles, thefts, odometer tampering and other), as well as recall information. 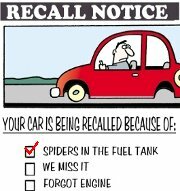 Also, note that there are age limitations on vehicles subject to a recall. You can do VIN recall lookup absolutely for free. One way in to go to the manufacturer website and check VIN for recalls there. Some manufacturers, for example, Toyota, provide recall information on their sites, the VIN number is all you need for that. If you cannot find where to look up recalls by VIN use sitemap. Another way to check VIN for recalls is calling to the dealership servicing the vehicles of your make in your area and asking them to check for recalls issued for a specific VIN number. Official dealerships dispose of the full database of recalled vehicles VIN numbers. NHTSA website also provides the information about recalls. However, vehicle recall lookup by VIN is not available. What you can obtain instead is the information on recent recalls based on the vehicle’s make/model/year. Alternatively, you cal call NHTSA at (888)DASH-2-DOT (1-888-327-4236) and request any recall information on a certain vehicle. Please, be ready to provide make, model and production year. If for some reason you don’t know the make/model/year and have just the VIN, it’s not a problem. All this information is encoded in the VIN number, you just need to know how to decode the VIN. However, there is a much simpler way. You can go to the website of one of car history report providers mentioned above and enter the VIN in the free VIN lookup box. The free report will include the basic information about the vehicle, including make, model and production year. Even if recall lookup by VIN does not return any results but you believe you car has a serious mechanical or safety-related defect, you may still be eligible for a free repair or replacement. For this, you have to file a complaint with the NHTSA by calling them at (888) DASH-2-DOT or using a special form at the website. You can also request a PDF from, fill it out and send it by email to NHTSA. When multiple complaints on a specific defect accumulate, NHTSA initiates an investigation. If the manufacturer is found to be at fault, NHTSA will force it to issue recall.